Spring is here – and so is the melting snow in basements • Please DON’T HESITATE! • Call Us NOW. We're a family company, grounded in New England tradition. We’re local craftsmen with more than 37 years of experience – and a reputation that's very important to us. We've never gone away. And we've NEVER gone out of business. What sets REAL DRY apart? For one thing, our reviews are GENUINE! They’re not just MEANINGLESS initials attached to PHANTOM individuals living in RANDOM towns, but the ACTUAL names of REAL people and the communities in which they live. Check out our REVIEWS page! "You can't find any better." 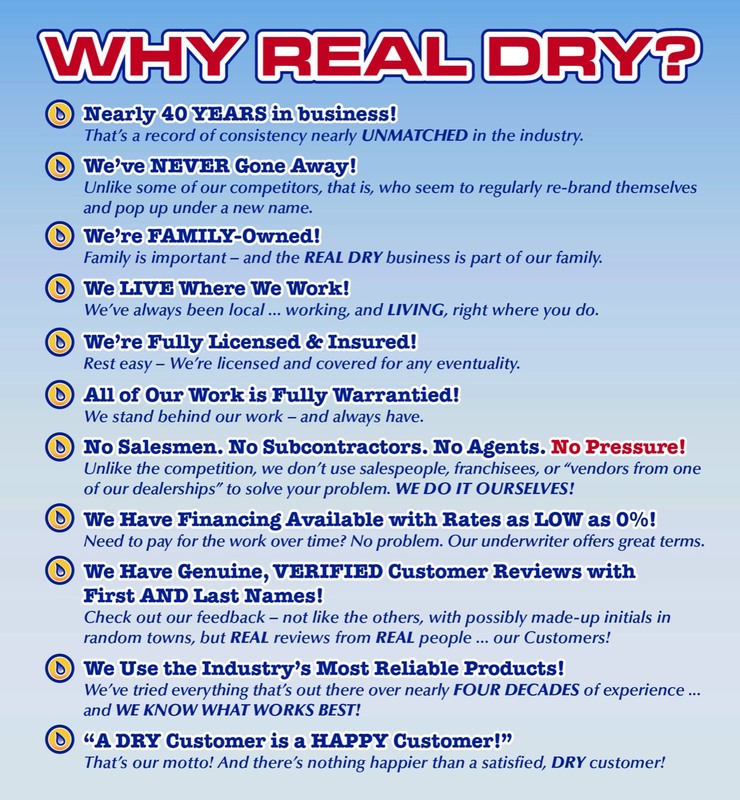 Real Dry is a family-owned company based in Holyoke & Scituate, Mass. We serve all of Massachusetts, including western Mass., the greater Boston area, and the South Shore, as well as northern Connecticut & Rhode Island, and southern New Hampshire. We take great pride in being a family-owned business – it sets us apart and makes us unique, just like your family, your home, or your business. Just like you, Real Dry is One-of-a-Kind.